The insertion (I) variant of the angiotensin-1 converting enzyme (ACE) I/D genetic polymorphism is associated with lower circulating and tissue ACE activity. Some studies have also suggested associations of ACE I/D genotype with endurance phenotypes. 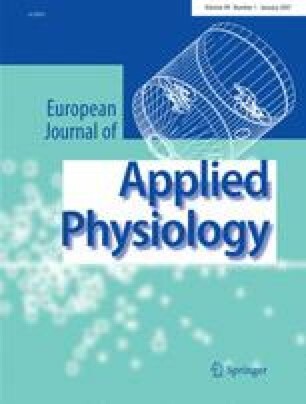 This study assessed the relationships between circulating ACE activity, ACE I/D genotype, mechanical efficiency and the maximal rate of oxygen uptake in sedentary individuals. Sixty-two untrained women were tested for mechanical efficiency during submaximal cycle ergometry (delta and gross efficiencies during exercise between 40 and 80 W) and the maximal rate of oxygen uptake during incremental treadmill running. Respiratory variables were measured using indirect calorimetry. Venous blood was obtained for direct assay of circulating ACE activity, allowing for the assessment of correlations between two continuous variables, rather than a categorical analysis of endurance phenotype by genotype alone. ACE I/D genotype was also determined, and was strongly associated with circulating ACE activity (P < 0.0005). Neither circulating ACE activity (27.4 ± 8.4 nM His-Leu-ml−1) nor ACE genotype showed a statistically significant association with any of the endurance phenotypes measured. The weak correlations observed included r = −0.122 (P = 0.229) for the relationship between delta efficiency (23.9 ± 2.5%) and circulating ACE activity and r = 0.134 (P > 0.6) for the relationship between maximal aerobic power (149.1 ± 22.9 ml kg−2/3 min−1) and circulating ACE activity. The data do not support a role for systemic ACE activity in the regulation of endurance performance in sedentary individuals, extending this observation to a large female cohort. This study was supported by a grant from The Sir Jules Thorn Charitable Trust. SSD was supported by British Heart Foundation Grant FS/2001044, with work carried out at the Centre for Cardiovascular Genetics, British Heart Foundation Laboratories, Royal Free & University College London Medical School, London, UK.